No matter where nurses practice or what the population of patients they serve, the MNA has the tools, the resources and the support nurses need to be the best they can be and to ensure that the patients they care for receive the care they deserve. In the workplace, on Beacon Hill, in every community in the Commonwealth, the MNA is the power behind nurses’ professional practice. Work for improvement and availability of health care services for all people. Foster high standards of nursing practice, education and research. Promote the health and safety of nurses. 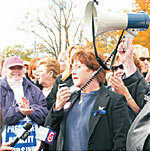 Act and speak for registered nurses in Massachusetts. Foster involvement by RNs in the political process to shape sound health policies.